I had been looking forward to reading about Flora Poste’s Christmas exploits at Cold Comfort Farm, she is rather a hero of mine and I thought a Starkadder family Christmas gathering would play to her strengths. As a result, I did not even peek at the book until Christmas Day so as to better enjoy it. Imagine my disappointment then when I found that the ‘first chapter’ of Christmas at Cold Comfort Farm wasn’t a chapter, but a story, and the story was not about Flora, or even Cold Comfort Farm, but about a single woman who thinks she loves her perfect single life Christmas in her perfect cottage, but then realises that maybe her life isn’t as perfect as she thought (oh and that she needs a man). Yes, that’s right…it’s a collection of short stories! With only ONE story about Cold Comfort Farm which even more upsettingly doesn’t even include Flora. Nowhere on the cover or on the back cover blurb does the publisher flag that this is a collection of short stories, and I quote [front cover] “Christmas at Cold Comfort Farm. 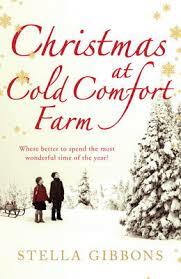 Where better to spend the most wonderful time of the year” and [back cover] “Christmas at Cold Comfort Farm will remind you that Christmas is a magical time of year and that romance can blossom in the least likely of place.” Does this or does this not sound like a story, set during Christmas, AT Cold Comfort Farm? You have to flick through the front matter to the publisher ‘Note’ and then the contents page to establish its short story status. Bah. Anyway, rant over. Setting my disappointment aside, and losing my Christmassy feeling very quickly, I read my way through the short stories and actually quite enjoyed them. They are very much period pieces and only two of them are Christmas-based (they reminded me of E. M. Delafield’s writing) but two I liked specifically were ‘The Murder Mark’ and ‘The Hoofer and the Lady’. Oh and a word to those who have not yet come across the joy that is Cold Comfort Farm (winner of the 1933 Femina Vie Heureuse Prize according to goodreads.com) and therefore the wonders of Flora Poste who would have common sense written all the way through her if she was a stick of rock. Read it. You will snort, laugh, titter and generally smile your way through this novel. 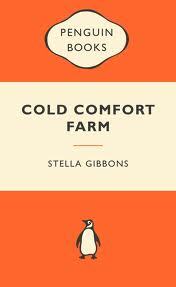 And once you have read the book, please then watch the 1995 BBC adaptation of Cold Comfort Farm. It has great casting – a young Rufus Sewell plays Seth Starkadder, the virile, rutting farmer’s son and Kate Beckinsale plays Flora Poste (pre-Underworld of course!) that most sensible and pragmatic hero; even Stephen Fry shows up as Mr Mybug, surely one of the best comic characters ever written, and all in all is as much fun to watch as the novel is to read. Somehow I have not yet read Cold Comfort Farm. I will ‘snort, laugh, titter and generally smile’? It is going on my list!